It has come to my attention that you have plantnapped Zucchini, and that you are now threatening to peel her. In response, this open letter will be my first and only warning. As the more refined of the food groups, the produce section has given some thought to the motives behind this savage and unprovoked attack. Now, I understand that meat comes from animals, which in itself provides some insight to your barbaric behavior—since animals are not the most intelligent of creatures, perhaps your primal instincts are getting the best of you. We produce are also aware of the process of raising livestock, so perhaps you’re a bit hormonal. Knowing how easily hormones cloud one’s thought process, we will keep in mind that controlling impulsive desires takes time, patience, and maturity. Let me make this very clear: we will not hesitate to send in the more militant plants from our section. Return Zucchini or face the consequences of your uncivilized actions. Cast – feel free to put up these flyers, but please do so in a responsible manner! Missing, Dear Produce. Tickets are $5 for students and $8 for adults. They can be reserved by emailing info@mcintoshtheater.org. Please email the number of tickets and the day you’d like to attend. Tickets may also be purchased at the door. Meat cast members – an extra show on Sunday, April 27 at 3pm has been approved. Please let me know ASAP if you would not be able to attend this show! We have Zucchini. Give us what we want and nobody gets peeled. Lily, aka Drumstick, is Ursula in The Little Mermaid at the Legacy Theatre in Tyrone. I will be there for the FRIDAY show in case anyone else wants to join me (or in case you want to avoid me!). There are not many tickets left for Friday, so you should call the box office at 404-895-1473 to reserve a ticket. Saturday is sold out. The show is this Wednesday and Friday at 7:30 and Saturday, 3:00 Here’s a link to the website https://starfire.websitewelcome.com/~legacy/tickets/show.php?ID=30 Lily is in cast A. Students of the Month – Katy L and Maria Mc! Congratulations to Katy and Maria! 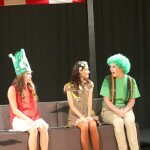 Both have been critically important to the drama program and the two productions this year. I am so proud and honored that they are a part of this program. I nominate Katy L as Drama Student of the Month. She has been in this program for four years now and has done nothing but work hard and help others. She is always there when you need her to be and always manages to cheer people up when they’re sad. Katy has amazing talent that she doesn’t always get to show. But when she does get to show her talent, she shines. Katy is truly amazing, and kind, and hard working, and knowledgeable. Katy deserves to have this award every month, but since she can’t, I believe that she deserves to start out this tradition. She is the rock in management. She took on stage managing of Chicago, even though she knew exactly what she was getting into, and on top of that, she did a fabulous job. She handles all issues with a determined ease. She knows, through her own self-confidence and competence, that the issue will be fixed, no tears, no stress, necessary. She is the rock of the psychological well-being of all actors and crew. Let’s be honest. Being a teenager is hard. Your body does all sorts of wacky things with its hormones, throwing you, the poor teenager, on a never ending roller-coaster of emotions. As if this weren’t scary enough, it gets worse. Theater kids often feel deeper, feel more, than the average Joe. The theater-kid-roller-coaster has no seat belts. Yet, Maria, brave as she is, dives into these emotions to save her drowning peers. Again, and again, and again, Maria dives in, fully clothed, fully blinded, fully willing to save. A rider of the roller-coaster herself, Maria offers her experience and advice to all. She can always tell when something is wrong. No matter what the issue, Maria is willing to drop everything to help that one individual. She is the rock on stage. Maria’s talent does not end behind stage. On-stage, in the spot light, Maria shines brilliantly. She leads the audience to love, over and over. Her performance as E.M. in Wit brings goose bumps, if not tears, to every member of the audience. Perhaps the greatest thing of our rock, is her humbleness. She never expects anything in return. Not even a thank you. Thank you Jessica and Emily for your kind words. Also nominated anonymously, Con Law, who was described as a Swagbot. I’m not certain if this is good or bad, or how it relates to drama. Maybe next time, Connor! I am now accepting nominations for the first Drama Student of the Month. This award is open to any student in a drama class (including tech theater) or involved in any production (cast or crew). If you would like to nominate someone, please send me an email or give me a note explaining why your nominee should be named Drama Student of the Month. The first award will be announced February 1st. A huge thank you to all of the students, parents and staff who helped make Chicago such a successful show and such a great experience. It was an honor working with all of you and I could not be prouder of what you have accomplished.